The biggest changes often come with the smallest shift – a shift in perception, a shift in the physical space. 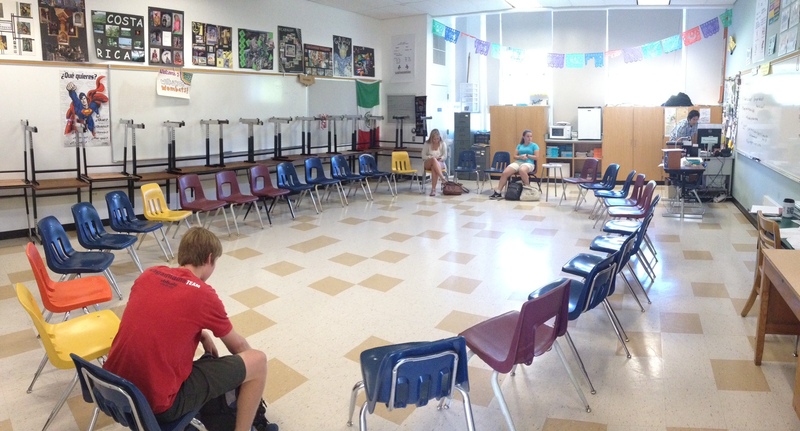 Two World Language colleagues have implemented an interesting shift in their classrooms: they have removed all desks. I wanted to capture, in their own words, what drove them to make this change and what their experience has been with it. Brian Zailian (BZ) teaches French at Tamalpais High School and Aaron Wilkerson (AW) teaches Spanish at Sir Francis Drake High School (@drakehighschool). 1) Why did you make the shift from desks to no desks? BZ: (I) got tired of not “reaching” the kids in the back rows….got tired of students texting under the desk…got tired of not being able to use all the space in the room to maximize the full-on experience. AW: We had been having different class discussions on a variety of topics (current events, debate topics, short stories) and people had to turn around to see someone else speak, others couldn’t hear well, just wasn’t as conducive for open conversation…so we formed a circle for that day and it worked. And it kinda stuck. 2) What changes has this shift brought about in how you interact with your students? In how they interact with each other? BZ: I am able to walk up to any student and speak to them one on one…I can turn the chairs in any direction and teach from a different side of the room (which makes the moment feel like the first day of school). AW: It has been great. It really helps get us on the same wavelength. In a sense, they are practicing public speaking every time they say something, even if it to ask a simple question. They learn to look at people when they speak, we all face each other, if somebody needs help…they don’t have to hound me down, I’m right in their direct line of sight…and more importantly, I don’t even have to give them the answer. I can say “Who will answer that?” and a classmate can answer the question without our missing a beat. 3) What new ideas/teaching practices have emerged because of this change? BZ: Better storytelling (more like being around a campfire)…better community building (everyone is nestled together in chairs), more of a group experience learning a language rather than an individual I’m-at-a-desk experience. AW: We still do pair work, but now they can talk with different people because I encourage them to sit in different places. We do a lot more brainstorming as a group, and doing reflections (on projects/activities/etc.) is more a communal effort that we can do in real time. Not to mention the spontaneous salsa/merengue dancing that occurs with that wide open space! 4) What challenges have you faced in making this change? BZ: Breaking up cliques that form (sewing circles), kids putting their feet on the chairs, kids learning how to text behind their upraised knees ! AW: Not trying to be glib, but the teaching challenges that exist aren’t related to this change. 5) Has this change led you to consider other “shifts” in your physical environment? BZ: No other shifts come to mind…however, we are using the space to its best advantage…feels more like a theatre course. AW: Yes, thoughts still brewing. Nothing to report as of now. 6) What advice do you have for anyone thinking about a change like this? BZ: Try it…you can always bring the desks back if it doesn’t work. AW: I don’t know that it fits every teaching style, nor that it would benefit every class. I know that it absolutely has improved my class in different ways (smooth transitions, open discussions, respect when others are talking, no texting under a desk, “pressure” to pay attention because all eyes are on you!, etc.) and I would say to just do it. I planned on doing it for one day only. You can always put the desks back. Or maybe do a hybrid, e.g., have a circle but with desks…or a circle within a circle…be creative. This is cross-posted at classroomrenewal.wordpress.com.